Last month’s news of Abercrombie & Fitch and Forever 21 announced the phased closing of their stores in Central and Causeway Bay as a response to a mainland retail slump in Hong Kong. Surprisingly, this morsel of November news was paired with Alibaba’s outrageous “11.11 Singles Day” retail results and the launch of Tmall.hk. Commercial retail space is not getting any more affordable in Hong Kong – this is supported by independent statistics and the surprising amount of untenanted space. Even our government is in the process of studying the development of underground retail spaces – intended to allow new players to the retail scene with hopefully more affordable rent in exchange for sunlight. Originally, the premise behind large stores was to make the retail shopping experience convenient for consumers – multiple products under one roof. Globally, this convenience is now replaced by online and mobile shopping especially in countries with copious amounts of land area. 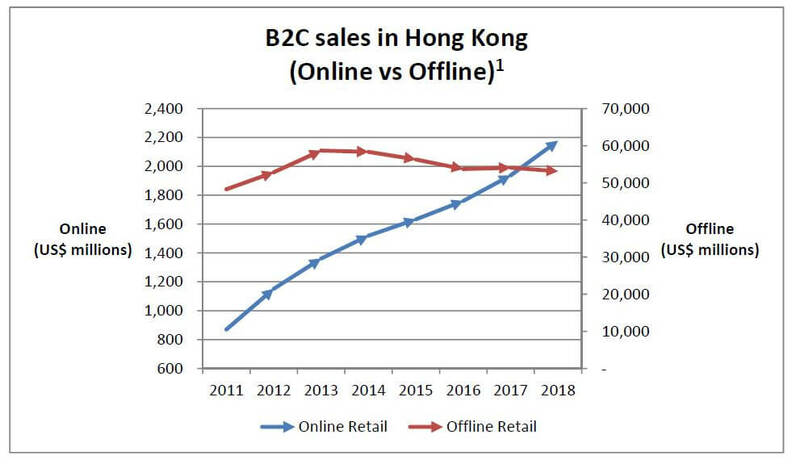 Looking at local numbers, there is no doubt that online retail is growing faster than in-store retail in Hong Kong. From the chart, a key observation is that online sales has more than doubled between 2011 and 2016 versus offline sales being steady to declining. In a city like HK with minimal space, love of shopping and a 87% smartphone2 penetration rate, what does this signal for the retail sector in HK from a merchant and consumer perspective? Putting aside the specifics of the statement, let’s consider the fact – a rather large and successful online retailer decides to use a city of roughly 7.5 million people (on a good day everyone is shopping) to test their global expansion strategy. How should small retailers respond to this data? The face and strategy of offline retail needs to change in light of increasing rents and consumer behaviour – co-work spaces4 have done it for real estate, why not retail? It’s about a business being able to adapt, innovate and maintain resilience throughout its life-cycle. In what way(s) is your retail business looking beyond HK towards regional/global? How to leverage existing retail infrastructure for pop-up stores + effective social media marketing? Is your infrastructure (tech, entity, supply chain) ready to scale/pivot? Are the next generation of offline retail (non-grocery) stores going to be display only showrooms (low to zero inventory) solely dedicated to immersive consumer experience with sales made online via tablet/mobile being routed to a central stock warehouse which dispatches the product directly to the customer and delivered by the time they arrive home? Is there space for a secondary marketplace here in HK like https://2.taobao.com/? Early days yet, but what does technology like virtual reality mean for retailers and consumers? Enough from me – over to you. 4 Garage Society has opened a new location at Sai Ying Pun that has a retail element; The Wave in Kowloon Bay has a monstrous space available for pop-up style markets and collective exhibitions.